It won't be long enough before tennis would find its newest prince - in the form of Ernests Gulbis. 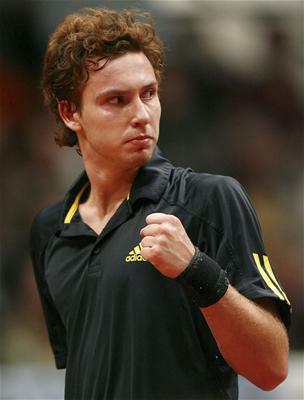 This Marat Safin-like Latvian tennis player has got enough to talent to rule the world of tennis one day. You think Novak Djokovic and Andy Murray are Rafael Nadal's rivals as Roger Federer's heir apparent? Think of adding Ernests Gulbis in the mix. Ernests is a 21 year old tennis player from Lativa who comes from a very wealthy family. Word has it that while others board commercials flights to and from different cities, he boards his own private plane. “I know that Gulbis is the player with the most potential right now,”said Federer after defeating him in Qatar quarterfinals earlier this year. "He has immense power on both sides and one of the fastest serves in the game, I think he's got a great future." Roger Federer again after being defeated by him on the 2nd round of the Rome Masters a few days ago. “It’s really difficult to play against Gulbis. His serve was really unbelievable.” Rafael Nadal, after defeating him on their grueling semifinal encounter in Rome yesterday. Watch out for Ernests Gulbis. He will be somebody someday. on money's on him, huh? i'm excited to see him inside the top 15 before the year ends.